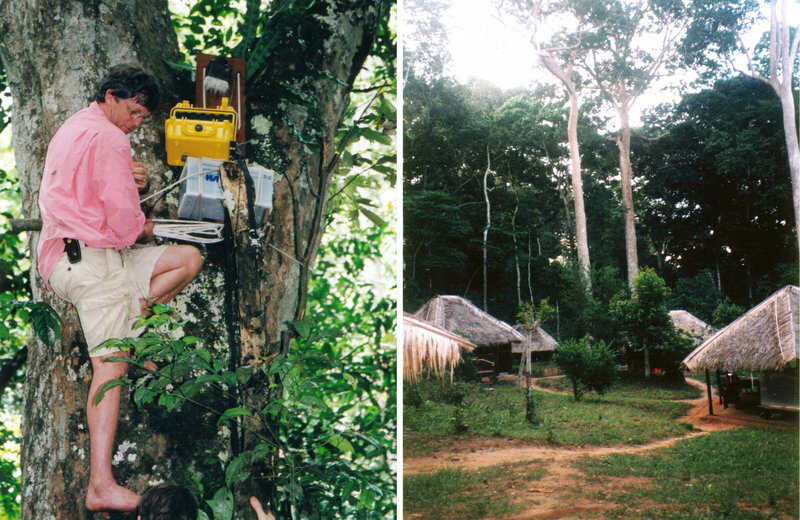 Katy Payne, the same biologist who recognized song in the calls of humpback whales in the 1960s, went on to help create the Elephant Listening Project in the Central African Republic in the 1980s. 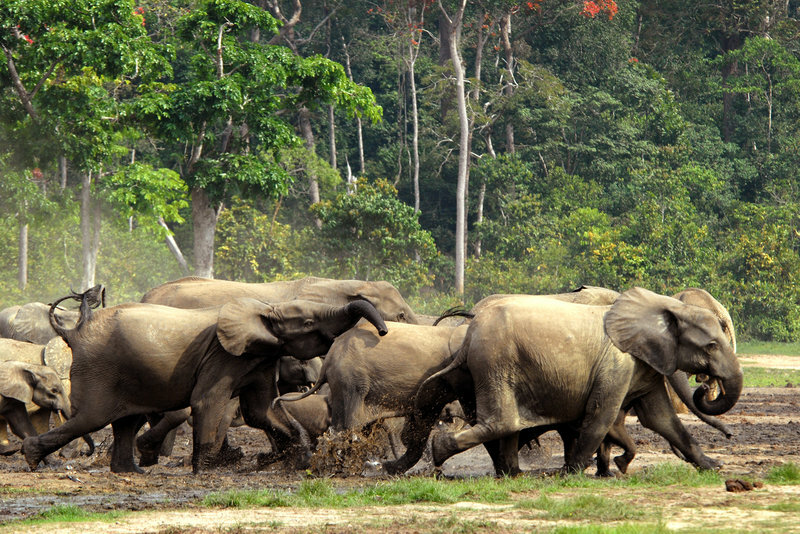 At the time, Payne&apos;s team was living in shacks in a dense jungle inhabited by hundreds of rare forest elephants. That&apos;s where one of us — Bill McQuay — first encountered the roar of an elephant in 2002, while reporting a story for an NPR-National Geographic collaboration called Radio Expeditions. I was walking through this rainforest to an observation platform built up in a tree — out of the reach of the elephants. I climbed up onto the platform, a somewhat treacherous exercise with all my recording gear. Then I set up my recording equipment, put on the headphones, and started listening. That first elephant roar sounded close. But I was so focused on the settings on my recorder that I didn&apos;t bother to look around. The second roar sounded a lot closer. I thought, this is so cool! What I didn&apos;t realize was, there was this huge bull elephant standing right underneath me — pointing his trunk up at me, just a few feet away. Apparently he was making a "dominance display." The thing is, I was so busy listening, I never looked up. I never saw him. The scientists on the other platform saw the whole thing. They found it rather amusing. After all, they actually lived among the elephants, day in, day out — part of a listening culture that&apos;s evolved among scientists over the last 60 years. They collect and interpret sound to understand how the natural world works. And they&apos;ve come to realize that the sounds and sights they first encounter are often just a tease to what&apos;sreally going on beneath the surface. As a listening pioneer in this field of bioacoustics, Katy Payne had already shocked the scientific world 33 years earlier when she caught the music in whale song. But listening to elephants in Africa was an altogether different thing: You had to get much closer to study them. Payne recalls one of her own close encounters in the forest. "We suddenly heard a tremendous roar and rumble," she told NPR in 2002, "really, really close to us. And there was this elephant — huger and bigger than life, with her ears flared — rumbling and roaring at us. And we climbed a tree quite quickly." What Payne has been willing to risk her life to capture on tape is a mysterious kind of elephant sound that may have deeper meaning than much of what we can hear. This different kind of audio — infrasound — is transmitted at very low frequencies, almost like seismic waves. Payne was at a zoo in Portland, Oregon in 1984, when she first realized that elephants make these sounds. She was at the zoo to give a talk about whales, but took a little time off that day to hang out at the elephant enclosure, just for fun. "I began to realize, every now and then, I was feeling a throbbing in the air," she recalls. She says it reminded her of an experience she&apos;d had singing the music of Bach in a large chorus, accompanied by a pipe organ. "I realized that was the same feeling I got when I used to sing at Cornell in the Sage Chapel," she says. "It would go low, low, low. When the pipes go down, you begin to lose pitch — and pitch is replaced by feeling." "I thought, &apos;Maybe the elephants are making sounds too low for me to hear, but powerful enough to feel.&apos; "
She asked engineers at Cornell if they had equipment that could record that low-frequency sound. They said yes. But to actually hear it, they explained, you&apos;d have to speed it up when you play it back — from about 10 or 12 Hertz or less to above 20 or 30 Hertz. So Payne went back to the zoo and recorded that throbbing. When she played the sped-up recording, this is what she heard. That rumble occurred just as an old bull elephant was facing a female in the next enclosure. "They were calling back and forth toward each other," says Payne, but at a frequency below 20 Hertz — the lower limit of what humans can hear. To decode these deep signals of elephants in their natural environment, Payne flew to Africa. There she learned that the audible calls are just a fraction of the elephant vocabulary; an elaborate infrasound conversation goes on among the animals as well. Payne wanted to build a dictionary of that conversation, and to do that, she needed to record both the elephant sounds and their behavior at the same time. So her team wired the forest with microphones like so many Christmas ornaments, next to a clearing where many elephants often congregated. 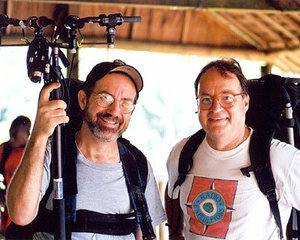 Engineer Christopher Clark from Cornell University was with Payne, and says he had to harden the microphones by putting them in protective cases; the elephants had a habit of smashing them. Being in the forest, Clark says, made him realize how useful infrasound is for elephants. The forest is a kind of muffling blanket — not just hard to see through, but hard to hear through, too, at least at the frequencies we&apos;re used to hearing. "What happens when the sound propagates through this dense forest," Clark explains, "is that the higher frequencies are lost, and it&apos;s the very low part of the rumble that propagates." The deepest rumbling is different from what we think of as sound, he says. It&apos;s more like the feeling of a pulsing bass line at a rock concert. The elephants produce these rumbles via their flexible larynx, long, loose vocal chords, and the large resonating chamber created by the mouth and trunk. Clark wrote a computer program that could sift through days-worth of recordings to find the infrasound calls. Then Payne could listen to them, and try to match the sound with field notes on the animals&apos; behavior. "Sometimes you&apos;ll see just one elephant come in and listen and listen and listen with ears flared and stiffened,&apos; Payne says. "Moving the head from side to side — and you know she&apos;s listening for a relative." Eventually Payne could connect the sounds with specific behaviors. "You watch them together, and then you get more rumbles and certain behaviors —great flappings of ears," she says. "And that&apos;s a greeting. And then you can say those rumbles are &apos;greeting rumbles.&apos; "
Some scientists suggest that the bones and membranes in the human ear are tuned to detect the frequencies of human speech. An elephant, with its much longer ear canal,extra-sturdy bones of the middle ear, and bigger ear drum, can detect much lower frequencies than people can, and more clearly, researchers say. The listening project has begun to create a sort of infrasound dictionary for elephants— a large set of different rumbles. Males ready to mate have a particular rumble, the scientists now know; a nursing female looking for its baby has a different one. And research has also shown that rumbles emanating from the mouth are different from those made by the end of the trunk — and may be different forms of communication. "We realized that they may be coordinating the behavior of elephant populations over large areas," Payne says, "that they — the infrasound rumbles — were being used over long distances." Only by listening more closely than ever before had the researchers discovered what&apos;s essentially a rumbling telegraph system, used by a far-flung community of animals roaming invisibly through the forest. 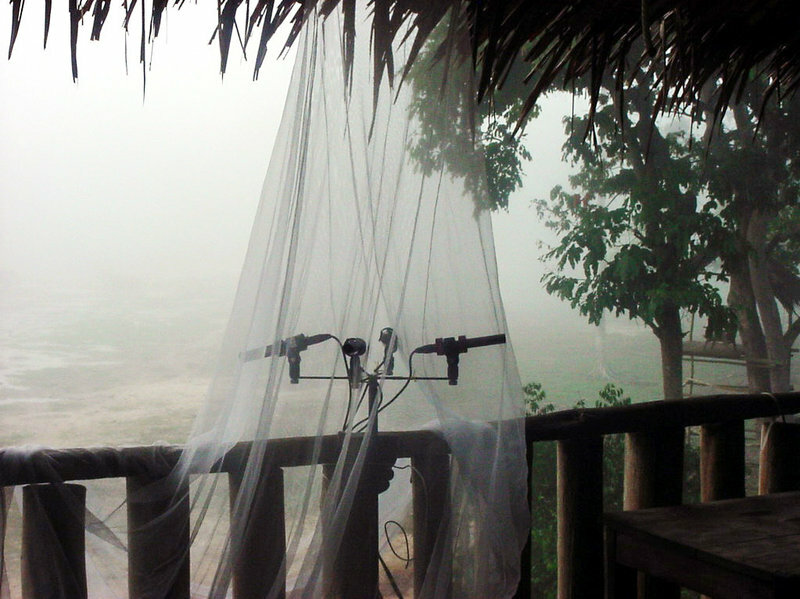 This story is part of Morning Edition&apos;s weekly series Close Listening: Decoding Nature Through Sound. The summer series is exploring the culture of listening that&apos;s developed among scientists seeking to understand how animals communicate. Bill McQuay is an audio producer at the Cornell Lab of Ornithology. Alison Richards, NPR&apos;s senior editor for science, is the series&apos; editor.